Staying active is important at every age. National Senior Health & Fitness Day, this year on May 30, serves as a reminder that staying active has benefits at every age. Older adults will participate in activities at more than 1,000 locations throughout the United States on May 30. This year's National Senior Health & Fitness Day theme is "Get Moving ... Start Improving!" It's organized as a public-private partnership by the Mature Market Resource Center, an information clearinghouse for the older adult market. Keeping older Americans healthy and fit should be a year-round goal, and this event serves as a reminder to caregivers and seniors that staying active benefits us physically, mentally and emotionally at every age. 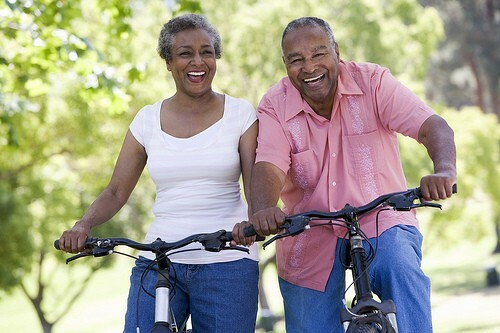 If your loved one’s doctor approves and encourages activity, try something new this spring to keep you both motivated. Organizations in communities across the country host health and fitness related activities for older adults on Fitness Day, such as fitness walks, low-impact exercise, health screenings, workshops and more. Information can be found at local senior centers, retirement communities, agencies on aging, hospitals, health clubs, churches, and park and recreation departments. Planting flowers or a small vegetable garden. Tidying up the house or yard together. Visiting a museum or nature preserve. Shopping at an outdoor farmers or flea market. Picking up a tai chi DVD or taking a class.